After seven straight days of train travel, it’s about time I give you some insight into Indian trains and some of the tricks of the trade to help get the most enjoyment possible out of a trip. 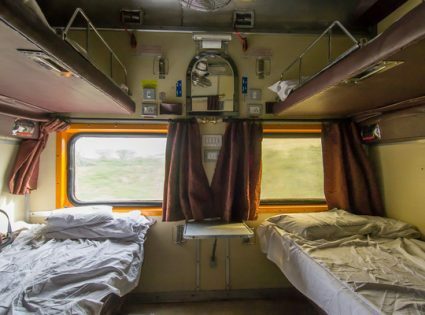 It’s too easy to pick the wrong berth and not sleep a wink, so read ahead if you think you’ll ever catch an India long-haul train. I’ll start with a run-down of the most common carriage classes, from lowest to highest. As the name implies, this is for people with a ticket, but without a reserved seat. It’s unlikely you ‘ll be able to lay flat, even on very long trips, and it’s indeed likely that you’ll have to stand up for some of the trips. This class is generally taken by lower-class locals, as the cost is a fraction of the other types. We haven’t yet taken unreserved on a long-haul train, but we have on local trains. The advantage, if it’s not packed to the rafters, is that you can enjoy the fresh air, hang out the door and walk about talking to locals. This class requires a reservation, and as the name suggests, these carriages include sleeping berths. Like most sleeping cars, the configuration tends to be one open cabin on the left and a straight bunk berth on the other side of the aisle. In the open cabin, two bench seats are facing each other. These convert into triple bunk beds on either side. So, six people can sleep in the cabin and two people across the aisle. The main advantage of SL, in my opinion, is that there’s no AC. This is great for moderate temps in which the AC is too cold and stuffy. Disadvantages include no blankets, triple bunks, and harder/dirtier beds. Don’t be fooled, 1st class is only the highest non-AC class. And as much as I dislike AC (though I may change my mind in the warmth of South India), it was in 1st Class that I think I caught my common cold. It was a freezing night, and there were no blankets. So although we had nifty locked cabins, a similar configuration to 1AC (the real 1st class), we were freezing and uncomfortable. That said, I would love the 1st class in the daytime. It would be my favorite carriage for sure. It provides the security and privacy of 1AC but lacks the stuffy AC. My only other gripe was that our beds were filthy in 1st Class. Many of us spent 20 minutes wiping them down with baby wipes. When I say dirty, I mean if we had slept on them, we’d have looked like we came from working a full shift in a coal mine. 3AC has the same bed configuration as SL, but has air conditioning, and is, therefore, more expensive with fewer hassles (such as beggars). We just spent 10 or so hours in 3AC on the Rajdhani. It is almost identical to 2AC but has triple bunks in the open cabins. That makes it a little more cramped in the day if everyone is sitting down. When people are sitting, the 2nd level bunk can’t be opened because it’s too low. So this reduces your flexibility. Only the top bunk (or side berth) owners can lay down whenever they want during the day. In some trains, 3AC may not have curtains, which also sets it apart from 2AC. But our experience has shown this to be rare. As I mentioned above, it’s the same as 3AC, but only with double bunks in the open cabin. The side bunks are the same, so you can generally save a third of the ticket cost and get the same seat and service by booking a side berth in 3AC. The only minor difference is that the cabin in 3AC is a little busier. This is the actual 1st Class. Everyone gets a locked cabin: some are four berths and some are two berths, called coupes. There are more power sockets; everything is cleaner and generally operational. The food is better; the carriages are quieter, but, the ticket price is often twice 2AC. Prices are all relative though. Whereas a 1st class cabin in Canada or Australia would run into the many thousands of dollars, here, on the Rajdhani from Dibrugarh to Delhi for example, it’s only about $50. Despite the general specs, the same class on different trains can vary. For example, power sockets are hit and miss. In 2AC and 3AC they’re rarely in the side berths, but then sometimes they are. Also, the size of the windows and placement of storage nets can vary. And then there are the toilets, which may have soap, may have a flush button, and may have a hole or a full Western cistern system. I certainly don’t claim to be a trainophile (more commonly called a train spotter), but I’ve traveled with a few for seven days now and am picking up their tips and tricks. Side berths are best if you’re traveling alone due to the privacy. Open cabins are best otherwise; it’s easier to maneuver your gear, you’re more likely to get power sockets, and the beds seem a little more full. Unless you’re on a very tight budget, 2AC is typically the way to go. 1AC is still quite cheap, and well worth a try at some stage, but for the real experience, it’s vital to try SL or even unreserved at some stage (and local unreserved doesn’t count). Don’t misjudge the air conditioning; always hang onto your blanket. Top bunk is usually best in the open cabins because you can lay down at any time of the day. But, maneuvering your gear is more difficult. The power sockets are also generally closer to the top bunks. The lower side berth is much better than the top, and arguably the best seat in the house because it has the best viewing experience. You get a large window all to yourself and can watch the world zip past all day. The India style toilet is often less smelly and a little cleaner. Once you learn to use it properly, you’ll realize it’s even more hygienic and less hassle. You only tend to get food on the Rajdhani; most other trains do not provide any food. But we’ve eaten all the street food under the sun from off the platforms when the trains stop, and it’s generally very cheap and delicious.